Doctors prescribe thyroid medication, usually levothyroxine (Synthroid, Levoxyl, Unithroid), to boost your thyroid hormone levels when they are too low. There are no recommended dietary restrictions for people taking thyroid medication. Some animal-based research, however, suggests that extremely high doses of catechins -- a group of naturally occurring chemicals found in green tea -- may affect thyroid function and thyroid hormone actions. But because there is no evidence that these possible effects are harmful in humans, medical treatment guidelines for thyroid diseases do not prohibit you from drinking the tea if you're taking thyroid medication. 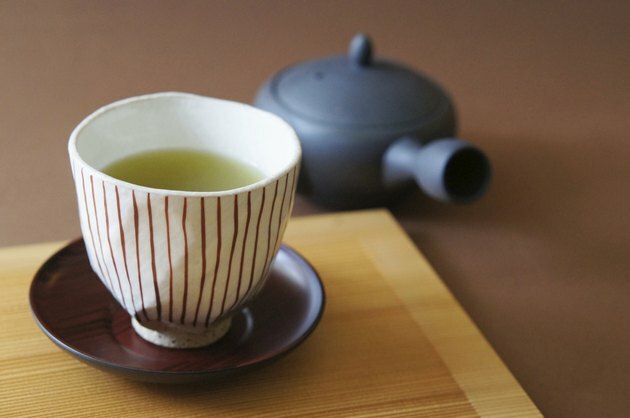 The catechins in green tea are credited with many of its purported benefits. But when administered at extremely high doses -- much higher than you would get from drinking even large amounts of green tea -- catechins were found to disrupt normal thyroid function in rats and block hormone production, according to a February 2013 study published in "Molecular and Cellular Biochemistry." This study and a similar animal study published in August 2011 in "Human and Experimental Toxicology" found that high-dose catechins decreased the amount of thyroid hormone in the blood of the study rats and caused enlargement of their thyroid glands. It's not known whether the much lower levels of catechins in green tea have any affect on the thyroid gland in people because there have been no research studies to address this question. If you're taking thyroid medication, talk with your doctor about whether it's safe for you to drink green tea. While green tea is generally safe to drink in moderate amounts for most adults, there are reports that green tea extract -- a supplement containing high concentrations of green tea chemicals -- may inflame and injure your liver. If you're taking green tea extract and have abdominal pain, dark urine or yellowing of the skin or eyes, see your doctor right away. Herbal Medicine: Biomolecular and Clinical Aspects; Mauro Serafini, et al.